Football has been one of the most followed sports in the past decades. With an average attendance of 53k in a single match for the past years, let’s get into this FIFA fever as well! Imagine your favorite team having a single face which includes features from all the faces of the team! Will Neymar Jr. dominate his team’s average face? Unfortunately, this is not the way it works. 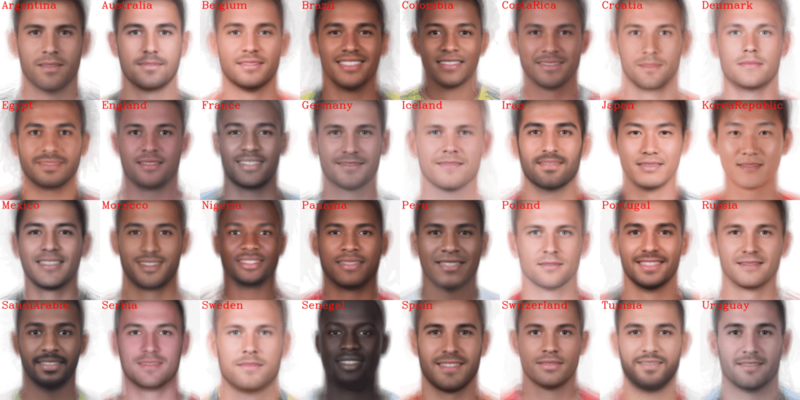 Using the face averaging technique, we decided to calculate average faces for each qualified team for FIFA World Cup 2018. We take photos of 23 players from every team and use our code in the blog post to calculate the average faces! Looks fascinating, doesn’t it? Let’s play a small game now. Play the video below, guess the country of the player shown correctly and share your score with us in the comments below! It’s interesting to note how the features of different players come into play when we calculate average faces. Let us have a good look at the faces now. Let us now try to analyze the average faces. What are the most pronounced features on a man’s face? Beard? Moustache? Forehead? Or a smile, maybe? Beard: : While beard is usually a personal choice and doesn’t generalize well on a large scale, but here we do see some pattern (a few players do seem to follow some common styles, it seems). From the image above, it’s clear that the Iranian and Saudi Arabian players must be having the full beard or long beard styles. The photos of the players are quite narrative in themselves when it comes to Iran and Saudi Arabia. Just opposite of which, since Koreans not having long beards are thus having an average face with almost no beard! Skin Tone: Skin tone by country is representative of their population usually. From the image above, Russia, Poland, Belgium, Australia etc. countries seem to be having lighter skin tone in their average faces. At the same time, Nigeria, Senegal, Panama etc are on a bit darker side as far as players are concerned. Smile: Players from Brazil, France, Mexico, Korean Republic, Croatia etc. seem to be quite happy in their looks! Well, they’ve got valid reasons to be happy. Haven’t they? While there are some, smiling but who knew what the mighty fate would do in the FIFA World Cup 2018? Let’s try to look at some exceptions to these features now. It is interesting to note that the majority is not always which dominates, but also the intensity of feature values. One of the good examples will be, the intensity of beard on a man’s face. In teams like France, where the majority of the team is on a lighter skin tone, the average face still points towards a bit darker tone. So there are some exceptions possible when the feature intensity present in minority of the members is dominant. We encourage you to compare these small features of average faces with the teams. This not only helps to understand the obvious things about a human’s face but also how the algorithm differs with small changes in features. If you liked this article and would like to download code (C++ and Python) and example images used in other posts of this blog, please subscribe to our newsletter. You will also receive a free Computer Vision Resource Guide. In our newsletter, we share OpenCV tutorials and examples written in C++/Python, and Computer Vision and Machine Learning algorithms and news. I don’t understand… does this mean you’ve merged the faces of every single player in a team into a single image? What we are doing, doesn’t mean merging the faces. Face Averaging is a collective term used which combines: Facial Landmark Detection, Coordinate Transformation, Face Alignment and further. I encourage you to go through this post: https://www.learnopencv.com/average-face-opencv-c-python-tutorial/ about Face Averaging. Thanks, I just didn’t realize CV has gotten this far. Since they can not be publicly distributed, we don’t have rights to share them. But the images are available at the link above.